The quick remote is on my lock screen like 5 times. I've been trying for months to find out how to get it off ! When i go to the shortcut setting for the lock screen it is showing that i don't have any ! Please help me ! My LG Optimus G Pro working perfectly fine but Suddenly "Sim-Card Is Not Detected". Tried Factory Reset but still " Not Detecting Any Sim-Card". Tried different Sim Cards, but same result. I just bought a LG Optimus G Pro E988 Phone in India. I want to connect it to my HD TV, but was unable to do so with a micro USB to HDMI Cable. I tried looking up at the settings to mirror or extend my display on my phone to TV, but did not find anything related to it. I also tried connecting my data cable to the USB port on my TV, that was not recognized either. Can anyone suggest me a way to connect them? Just eval the G Pro with others. Youll ask, ss did I, why pay more. Look at the reviewer's comments at page 7. The Polaris office suite? Is most efficient. Doing all mist will ever need. Polaris was a Brilliant choice LG made. Totally complete. Download HP's utility for free from Google's PlayStore. And you have a cmplete office. Create/edit. Print. The super-brite, Accurate screen tells you what you're going to see in Print form. LCD trumping Super Oled again. I boyght thus G Pro in May. Only thing that made me look back is the Note 3. But for 300 ( or 249 ) No. Fail. At nite I turn the screen to " 0 " when reading emails. Daytime. Sun on the screen? I'm still good at 90-100%. Fast. Fast. Fast. The "Q" aps allow me to do better than screen capture. I now when i see something my people need, Qslide it with my notes on top. I watch videos with the Qslide video ap on top of whatever I'm doing. Small number crunching? Same motion skides down the calc. Same with Note taking. This has become my cinstant companion. Oh, and it talks... Ty Google! Anonymous, 06 Jul 2013The idea that 1080 p resolution is light years ahead of 720 p on phones is absurd. Beyond bra... moreIm just curious? If you want to brag about your note 2. go to Note 2 page. Not here.As you can see, it says LG Optimus G pro. LG should be overhaul your UI making better hd icons, better screen images and better smooth transitions, after all is a very good Phone!! The idea that 1080 p resolution is light years ahead of 720 p on phones is absurd. Beyond bragging rights there is very little difference; videos are neck in neck when comparing and picture resolution is not remarkably greater; our eyes cant detect beyond a certain point. And theres the question. If all these factors are true you cant compare the optimus with note 2 because theyre both different. Note 2's wacom technology embedded in the screen makes the "stylus" pretty awesome for more than writing and drawing. Anyone that owns a note 2 will understand. Lg q memo is not the same. As far as hardware ive owned the 600 processor devices and older quadcore phones and do not see a difference in response time. I saw no difference between the functionality of the newer chipset when dealing with "realworld" tasks. You wont see it. Benchmarks are only invented to remind owners of the supposed badness of their devices. The poblem is developers arent taking advantage of the new chipsets every year and so it just keeps going down the line. honestly, i have the Optimus G and i wouldnt trade it for a g pro. However, the OG 2 is gonna be a BEAST. But, i kind of want to get the G Pro's camera software. The person who will do the review the mobiles, i think he/she is a fan of AMOLED screens. I think u better stop reviewing and give chance to others who doesn't like dull and oversaturated AMOLED screens. I think u never saw the screen richness of "Super-Clear LCD". Better see it first. I still don't see this phone in Singapore, is it out yet? I really need to get me one. This phone is unarguably the 2nd of the top 3 phones.My next phone. Of COURSE I have a comment!!! Why compare a phablet to a PHONE!!!??? ( Samsung S3) The S3 phone's screen is almost an INCH SMALLER!!!!!! How about a fair comparison. 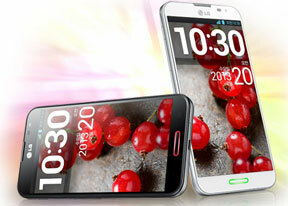 .. Like with the Note II by Samsung, LG's direct competitor. Rhe market LG was after. How about the CPU of the Note II. Also what they were after. But No. Lg is good brand company. lg optimus g very good battery and all phone.